Wishing all of you a Scary Halloween which sounds better than a Happy Halloween. Today we have a photo of a Japanese ghost or Obake. Hawaii has a lot of ghost stories many of them originating from Japan and about a faceless ghost. In this case she is faceless and carrying a head. 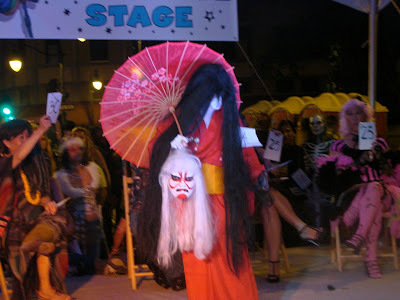 It was one of the award winning costumes at Chinatowns Hallawbaloo costume contest. If you are on Twitter follow us @hawaiiblog for more costume contest pictures. 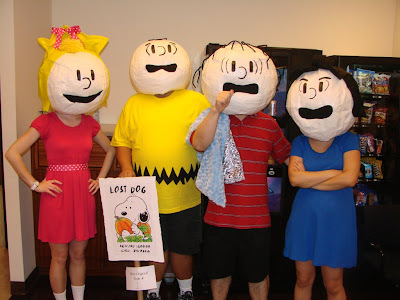 I got into the Halloween mood the other day watching the classic It’s the Great Pumpkin Charlie Brown on television and low and behold at the office today some people came in dressed as our favorite Peanuts gang. They even explained the lack of snoopy with a missing dog sign though we all know he was probably hunting for the Red Baron. Halloween is approaching and the jack-o-lanterns are getting ready for the big day on Sunday. Have you carved your pumpkin yet? 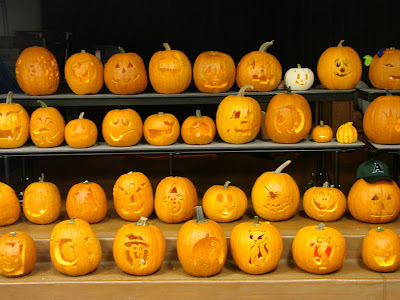 In this photo we show off a bunch of pumpkins carved at a local elementary school. Over the next few days we will switch our photo of the day into Halloween mode.